As the temperature continues to rise, we’re running our air conditioning pretty consistently. Especially with how hot it gets here in Phoenix, we have to do everything we can to stay cool and comfortable through the spring and summer. The last thing you want on a day where the thermometer is pushing three digits is for your HVAC system to stop working. At Integrity AC and Heating, we’ve seen firsthand how neglecting regular preventative maintenance spells disaster for HVAC systems, so we’ve put together this list of benefits you stand to gain from keeping your system working. If it’s been awhile since you’ve had your system inspected, call Integrity AC and Heating today so you’re ready for the upcoming hot summer heat. It seems like energy bills keep going up with every year, which means we need to do all we can to reduce those costs. Not only does it reduce your overall carbon footprint, it keeps a few more greenbacks in your wallet. When preventative maintenance is done for your HVAC system, you’re able to ensure it is running efficiently, minimizing the amount of money you have to spend on energy bills each month. Think of it like tuning up your car for better gas mileage. When an HVAC system is neglected, it will accrue a bunch of dirt, dust, and grime that will cause it to strain itself to operate. When a system has to work harder and longer to reach the temperatures you desire, it will burn out and break down. When that happens, you’re looking at a hefty price tag to replace your broken system. 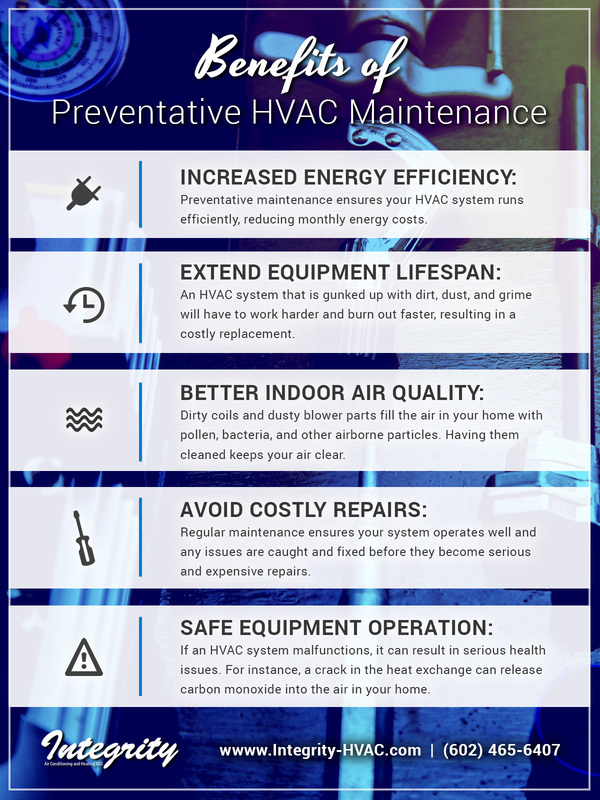 Preventative maintenance ensures everything is clean and operating as intended, extending the lifespan you can expect from your HVAC unit. When the coils and blower parts within your air conditioner get dirty, the quality of the air in your home will be severely impacted. You could be breathing in pollen, fungi, bacteria, and other airborne particles that can cause many different health problems. Whether those problems are asthma attacks, irritation of the eyes, nose, and throat, or flu-like illnesses, poor air quality affects everyone in your home. When your HVAC system is cleaned on a regular basis, your air will be clear of airborne contaminants, making for a happier and healthier household on the whole. As an HVAC system begins to break down after being neglected, parts will fail and performance will suffer. Before situations that would require a full system replacement, there are additional repairs that may be needed to keep your unit running, and those repairs can add up. It’s estimated that preventative care can reduce the need for a costly repair by up to 95 percent, especially since that maintenance will often catch small issues when they’re easy to fix before they grow into something worse. If an HVAC system malfunctions, it can cause bigger issues than just financial ones; it can actually endanger your family. For example, if your furnace develops a crack in the heat exchanger, it can cause carbon monoxide to escape, poisoning the air in your home. If you have an electric HVAC unit, it can short-circuit and create a fire hazard. Regular preventative HVAC maintenance keeps your family safe and avoids these disaster scenarios. Taking care of your HVAC system is a lot like taking care of your health — prevention is better than a cure. Stay on top of your HVAC maintenance to ensure it runs efficiently, safely, and without breakdowns. Between the savings on your energy bills and avoiding a costly repair or replacement, you can use that extra cash for a family vacation! If you are in need of preventative maintenance ahead of the summer heat, call Integrity AC and Heating today. Located here in Phoenix, we know how brutal it can get without working air conditioning. Give us a call and we’ll make sure your system keeps your family cool all summer long.